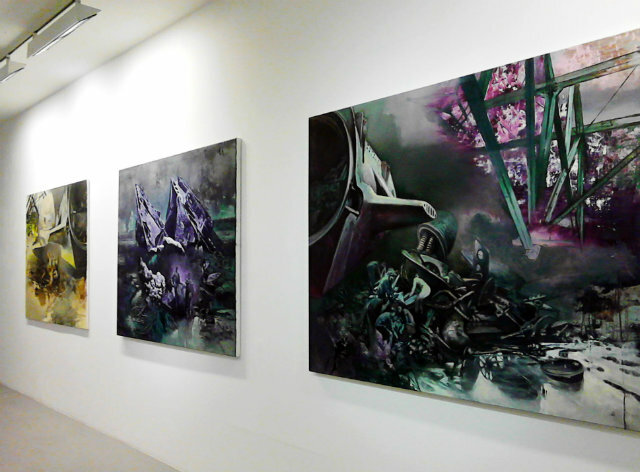 Sándor Szász brings his latest show, The Utopian Delusion, this autumn to Galerie Michael Schultz. 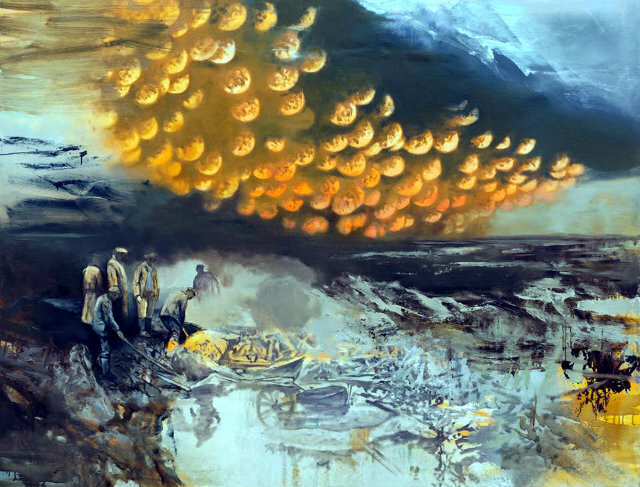 With a fantastic display of oil paintings depicting apocalyptic scenes, the collection is compelling and hair-raising. The artist gains inspiration from his personal life experiences in Romania with communist dictator Nicolae Ceaușescu. It is this knowledge applied to his paintings that produces such real and tangible art. As implied by the title of the collection, the paintings display a powerful juxtaposition of two realities. A perfect example of this is Riot of Silence, the oxymoronic title of which is reflected by the visual characteristics of the painting. Made up of mostly neutral, earthy tones, Szász augments the piece with transformational opposing patches of a bright pink. 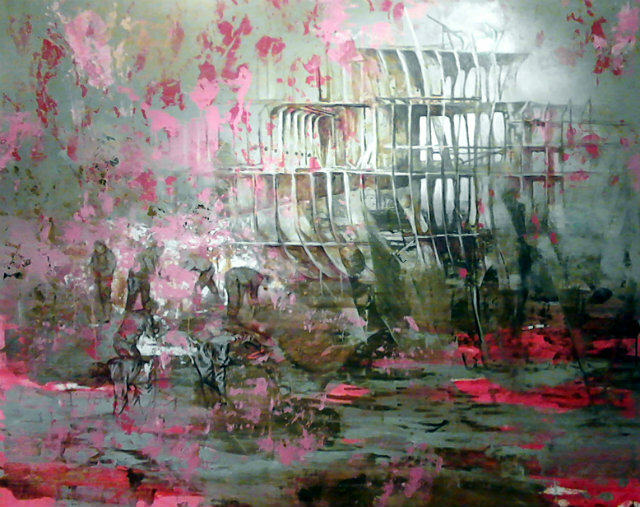 A similar technique is used throughout the collection; a balance between dark, neutral dullness that envisions a harsh cruelness of the mortal fate of the protagonists against a brilliant colour palette suggestive of hope and vitality. The colours of dark reality and euphoric delusion are well balanced by each other, making the images even more striking. The Dawn of the Magicians. The abstract abyss is also interspersed with a clear definition of certain structures in many pieces such as The Dawn of the Magicians. 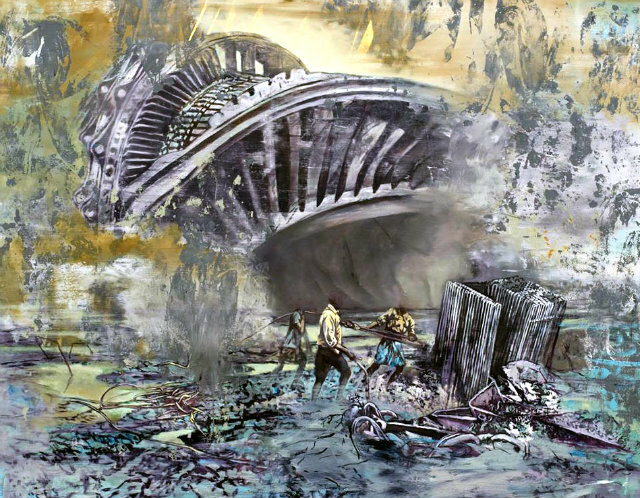 A large construction rises out of the painterly haze and leers over half obscured workers struggling amongst a scene of chaos and destruction. This technique makes the painting illusive and compels the viewer to look more closely and question the story being told. In addition to the deeper meaning, the artwork is visually outstanding and the viewer is able to be completely absorbed by the undulations of colour and texture. Following this style, Rider of the Apocalypse is one of the most prominent pieces in the show. The action again fades into a painterly abstraction, therefore only part of the scene is clearly distinguishable. Szász creates this stunning piece with his highly contrasting use of colour. While most of the lower half of the painting is created with earthy tones, hints of a brilliant golden hue creep in and introduce an intense, dramatic and overpowering golden sky. It is a thoroughly eye-catching, attention grabbing work of art. Not only with this piece but with the entire collection, visitors stand before Szász's paintings and are overwhelmed. Szász does not merely exercise an in-depth and thoughtfully specific use of colour, but he also paints with a variety of brush strokes and markings. This particular application gives the paintings and the stories they depict a heightened sense of meaning and profundity. Furthermore, there is a huge contrast between light and dark, both literally and metaphorically. The Utopian Delusion is a captivating collection well worth a visit. It will be on display at Galerie Michael Schultz, Mommsenstraße 34, 10629 Berlin, until 14th November 2015.